Still here! It’s just been a busy week of working on a reference publication project, meetings, and getting used to non-conference living again. I have two quick posts today, and when I return from my vacation next week, I will write more about SALALM and also a great new electronic resource that we have just purchased, called Digitalia. Second, on Sunday, in conjunction with the Joan Miró exhibit there, the Institut Ramon Llull is holding a concert at the National Gallery of Art called “Sounds of Catalonia.” More info here. Off next week, and then back to semi-regularly scheduled posting. Happy 4th! I arrived here mid-Thursday afternoon, very tired, and honestly, mostly I remember watching TV and sleeping. I also got room service, a delicious Trinidadian soup made with calaloo (kind of like spinach) and coconut milk along with …a cheeseburger. 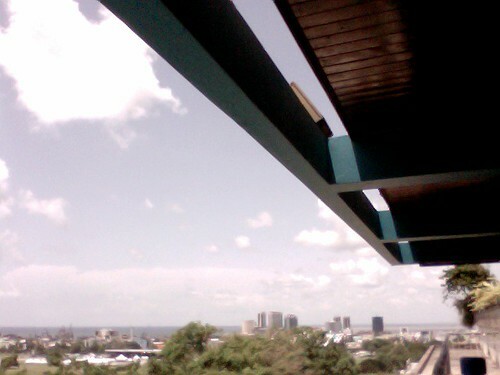 Friday I explored the city a bit, stopping by the National Library (very nice) where they had an exhibit on the suburb of Port of Spain called St. James, which was mostly settled by south Asians in the late 19th-century after their indenture contracts ran out. Last night I went with some friends to a suburb called Woodbrook, and ended up having some delicious Italian food of all things. Yesterday the organization’s conference meetings took place. I attended the Electronic Resources committee (of which I am the new chair! ), Membership, Interlibrary Cooperation, and a committee called ISIS, which stands for Iberian Studies in SALALM. In Electronic Resources, I learned of some new free sources mostly dealing with Central American countries, which I’ll share and add to my research guides at a later point. The folks in Membership mostly discussed issues of institutional membership, which I hope that Georgetown can do as well. In Interlibrary Cooperation, we discussed how to streamline a survey that is sent to research libraries that have large Latin American collections about their size and budget. I will be filling this survey out for Georgetown during the next round. Finally, in ISIS, I learned about some online digital libraries based in Portugal, and more on those later as well. Today the panel sessions start, going to my first one at 2:30 on digitization projects in the Caribbean. It’s 5:12 AM and I’m on 2 1/2 hours of sleep here at DCA, yay, so please excuse any incoherence in advance. I’m heading to Port of Spain, Trinidad and Tobago, for the 57th annual meeting of SALALM. At this meeting there are session about what’s going on in other Latin American library collections, more traditional scholarly presentations, as well as exhibits from various books and electronic resource vendors from around the world. The conference officially runs Saturday through Tuesday, and I’m going to try to post at least once per day. It’s a great conference; I usually learn a lot while being having fun at the same time. Have a look at the program in case there is something in particular you would like for me to attend. I’m looking forward to being in the English-speaking Caribbean for the first time, should be a great conference. Thanks for reading. Although this pre-print and peer-review service is currently only for the biological and medical sciences, PeerJ is an interesting take on scholarly publishing. An article about it is here, on a Chronicle of Higher Education blog. Sorry for not posting as much lately, but I’m preparing for a conference that I leave for this Thursday, so, busy days, but a different kind of busy. I just got word about this new online Catalan cultural magazine called Núvol. Here it is. I’ll be blogging from time to time from the conference, so more soon! 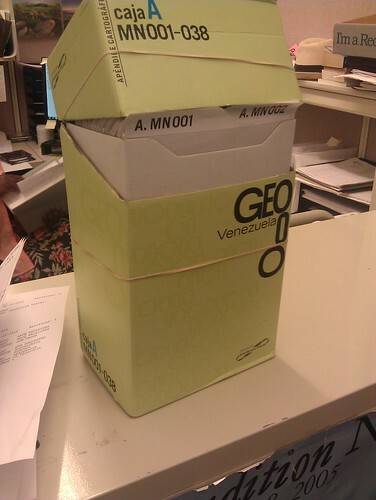 Yesterday my colleague Christine in acquisitions let me know that a big box of maps of Venezuela had arrived, a sample of which is illustrated above. In this mega-electronic age, it may seem a bit quaint to order actual paper maps. And honestly, normally I wouldn’t. Maps require a lot of storage and care, and for most common purposes, getting from point A to point B, online maps work fine. 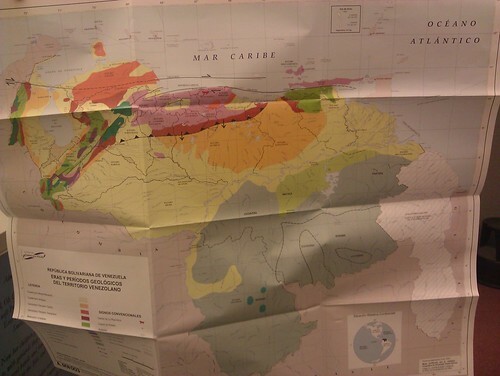 But given Venezuela’s prominence in the news these days and probably for at least the next few years, and the amount of information on these maps, I decided they were worth purchasing. It is true that you can see great details with online maps as well, but often the context is lost. Online, you can focus on a very tiny spot, but what is its relationship with some other tiny spot? 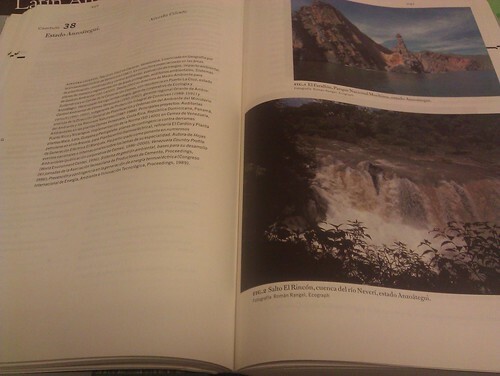 Then, in the text, there are references to specific maps, so you can follow along with exactly what they are describing. They have not been processed yet, but will be soon. Please let me know if you are interested in seeing them in person and we can rush process them. The books will be kept in the regular Lauinger stacks, and the maps will likely be held in reserve at the circulation desk in order to preserve them yet still maintain access.